Powers/Abilities: Madame Hydra was a superb hand-to-hand combatant, and skilled in swordsmanship and marksmanship. She wielded a machete, poisoned darts, and poisoned lipstick. She used a number of exotic means of transportation, including hovercrafts, hover-skiffs, and jetpacks. (Nick Fury, Agent of S.H.I.E.L.D. II#12 (fb) - BTS) - Since childhood, the woman known only as Madame Hydra fought for her life on war-torn streets, and lost her fear of death. (Nick Fury Vs. S.H.I.E.L.D.#3) - Madame Hydra met with Jimmy Woo of S.H.I.E.L.D. (actually a Deltan-model LMD serving the Deltite), and received from him the power core of the S.H.I.E.L.D. Helicarrier, with which HYDRA intended to construct a missile. (Nick Fury Vs. S.H.I.E.L.D.#4) - Madame Hydra met with her lover Weng, whose father Pail had been sought out by Nick Fury to help locate the HYDRA base in Hong Kong. Madame Hydra knocked Weng unconscious with her lipstick, then had surgeons implant a device within Weng's brain that would allow them to control him. She oversaw the construction of the missile as she reported to her Supreme Hydra (actually the Deltite), and was directed to be certain that Fury boarded the missile before it was launched. Madame Hydra hoped that she might be promoted to the position of "Madame Hydra One" for her actions. While waiting for Fury's arrival, she trained with several of her men, killing them all with her sword. When Weng brought Pail, John Allen, Al MacKenzie, Alexander Goodwin Pierce and Nick Fury into the sewers of Hong Kong to enter the base, they activated the implant, and he killed Allen and Pail before Fury killed him. Pierce was enraged by Allen's death and attacked the HYDRA agents, taking out dozens of men. 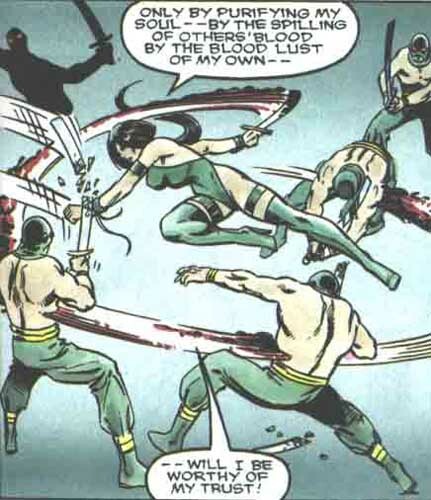 Madame Hydra was pleased to be facing "a warrior," and struck Pierce down with a dagger as they clashed. She attempted to lead Fury to the missile and bring him aboard it, but Fury evaded her long enough for the countdown to expire. Fury, Pierce, MacKenzie and Madame Hydra escaped the destruction of the base, while the missile slew 3,452 people in Hong Kong in the process of launching. (Nick Fury Vs. S.H.I.E.L.D.#5) - Madame Hydra agreed to lead Fury and his allies to an AIM base in the Himalayas. As they climbed the mountains, Madame Hydra was disgusted by the weakness of Pierce, who was still recovering from being stabbed by her. They finally succumbed to the weather, but were found by Encoders serving the Deltite, who took them all into custody, bringing them to the S.H.I.E.L.D. Satellite. (Nick Fury Vs. S.H.I.E.L.D.#6) - Madame Hydra was placed in a holding area with the other humans aboard the satellite, but wound up leading a one-person attack on their captors, and was soon joined by Pierce, whose bravery impressed her. They managed to defeat the Encoders and Deltans guarding them, took their weapons, and began to fight their way out of the satellite. Madame Hydra was shot by the Deltans, but Pierce pulled her out of the line of fire. Pierce helped her escape the satellite after the Clay Quartermain LMD overloaded the power core. (Nick Fury, Agent of S.H.I.E.L.D. II#1 - BTS) - From her cell at the Tyler Foundation for the Criminally Insane, Madame Hydra wrote Pierce love letters. (Nick Fury, Agent of S.H.I.E.L.D. II#9) - Madame Hydra continued to write love letters to Pierce from the mental institution, declaring her wish to make him her warrior. (Nick Fury, Agent of S.H.I.E.L.D. II#12) - As Madame Hydra was writing another letter to Pierce, she was confronted by Mai-Pan, a servant of the Yellow Claw, who teleported her out of her cell, and to an island in the China Seas. Mai-Pan tested her worthiness by setting fighters on her, and she impressed the Yellow Claw, who chose her to be his daughter and heir. A S.H.I.E.L.D. team including Pierce came in search of Madame Hydra, but she remained still, meditating upon the Claw's arrival. When the Yellow Claw did appear, he struck down all of the agents, and they took Pierce as their captive so that Madame Hydra could make him her lover. (Nick Fury, Agent of S.H.I.E.L.D. II#13) - Pierce was brainwashed to serve Madame Hydra and the Yellow Claw, and Madame Hydra was ordered by the Claw to rebuild his empire. She and Pierce led armies of HYDRA agents to islands in the China Seas, finding young people they could convert to the ranks of HYDRA. Madame Hydra was particularly impressed with one young man who fought back against them, and knocked him out with a nerve pinch. Madame Hydra made a pupil of the young man, and soon converted him to the ranks of HYDRA. She demonstrated his killer instinct before her warriors, and bested him in combat, but was convinced by Pierce to let him live and inspire others. The Yellow Claw then informed them that S.H.I.E.L.D. was on its way, and they donned battlesuits for the confrontation. She was surprised to find herself facing a new S.H.I.E.L.D. Helicarrier, but began the fight. During the clash, her pupil shot down Kate Neville. (Nick Fury, Agent of S.H.I.E.L.D. II#14) - As Madame Hydra gloated, Pierce put up a force field around them to fend off S.H.I.E.L.D. She railed against Fury as he stood over Neville, telling him that he had taken everything away from her, then sent Pierce to kill Fury. Network Nina tried to get Madame Hydra to drop her force field, and she finally did so that her pupil could shoot Nina, only to hit Al MacKenzie instead. She then went to finish off Neville, but Fury had broken through Pierce's brainwashing, and he turned on Madame Hydra, destroying her armor. Madame Hydra was taken captive and her followers were rounded up. When Fury was distracted by the surprise return of Timothy "Dum-Dum" Dugan, Madame Hydra set an explosive on the armor of one of the men guarding her, stole a jetpack and flew away, but Pierce chased after her, trying to convince her that she needed help. Madame Hydra responded that if she returned to the asylum, it would be a living death for her. In order to protect her soul's secrets, she snapped an explosive capsule, destroying herself. Comments: Created by Bob Harras, Paul Neary and Kim DeMulder. According to Nick Fury Vs. S.H.I.E.L.D.#4, the title of "Madame Hydra" has a number of levels, with "Madame Hydra One" being the highest position one can attain. The pupil was a young man living on an island in the China Seas who fought back against HYDRA when Madame Hydra led her forces to his home. She was impressed with his spirit, and made him her pupil, filling him with hate, and transforming him into a warrior. She then bested him in combat before her troops, but Alexander Goodwin Pierce convinced her to let him live so that he could inspire others. During HYDRA's battle with S.H.I.E.L.D., the pupil managed to hit both Kate Neville and Al MacKenzie, but was finally beaten by Nick Fury.